The newest addition to Baliey’s Fairytale™ Series of dwarf lilacs, Prince Charming™ has irresistible color and form. A beautiful, small lilac with a neat, compact habit. 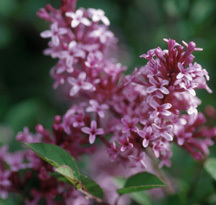 Deep, wine red buds appear in late spring and mature to lavender-pink blossoms. The combination of the two colors on one panicle is very attractive. The fragrance is warm and spicy. Prince Charming™ needs full sun and well-drained soil and will not tolerate wet feet. Well suited for a low hedge or specimen plant but really impressive when planted en masse. For a retail source of this plant go to :www.baileynursery.com and go to the “Find Our Plants” section.